President Donald Trump has decided to move the U.S. embassy in Israel from Tel Aviv to Jerusalem. "I have determined that it is time to officially recognize Jerusalem as the capital of Israel," Trump said. The White House made the announcement Wednesday. And it could have major consequences for the region because both Israel and Palestinians claim Jerusalem as the capital. 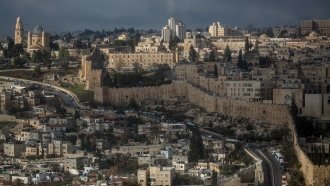 Israel has claimed the whole city as its capital since 1980, but most of the international community considers parts of Jerusalem occupied territory. That's why many countries — the U.S. included — have kept embassies in Tel Aviv instead. Trump originally mulled the idea of moving the embassy earlier this year. At the time, a former U.S. official in Jerusalem told The Washington Post the move would likely result in violence and possibly alienate the U.S.
Trump ultimately decided to hold off to avoid jeopardizing a possible peace agreement between Israel and the Palestinians. But this decision could upend the work Trump's son-in-law Jared Kushner has been doing to advance peace talks between the two groups. Trump has promised to move the U.S. embassy since he was on the campaign trail.